Encourages better root and blossom development, and healthier overall plant growth. 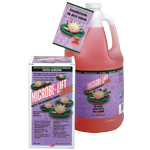 Specially Formulated For Natural Or Decorative Water Gardens. Encourages better root and blossom development and healthier overall plant growth. Ensures a healthy start for plants and reduces transplant shock.